Trying to find the perfect gift for a vegan or vegetarian loved one? Or maybe you’re the veggie foodie who is looking for vegan or vegetarian gift ideas to add to your wishlist. 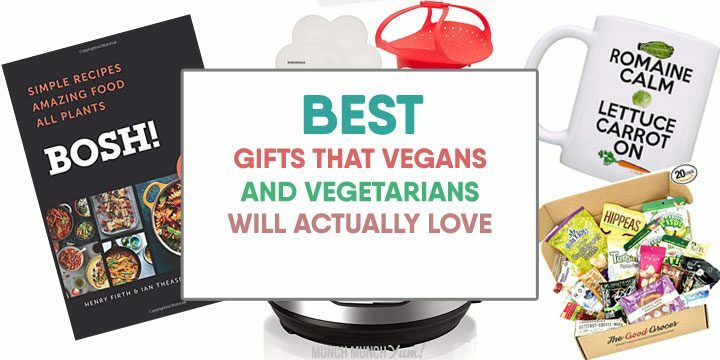 Whether it’s for Christmas, birthdays, or just ‘cuz, our list of great gift ideas for vegans and vegetarians will help you find just the right present for any veggie lover! Gift boxes with vegan snacks galore! You can’t get any more thoughtful than with this gift! Getting a gift basket is like getting loads of presents all at once! Pick one of these delicious assortments and treat your vegan or vegetarian to a whole medley of yummy stuff. Snag this snack box now! What’s better than getting a great gift? How about getting TEN great gifts every month? That’s what your loved one will score when you sign them up to receive these awesome snack boxes! Each box comes with at least ten vegan goodies for them to try, giving your gift recipient the perfect opportunity to explore the many delicious vegan snack options available! Feel free to send just one box, or delight your loved one all year round by signing up for a longer subscription. Vegan Cuts also offers other vegan subscription boxes, like their 100% cruelty-free vegan makeup boxes & vegan beauty box (both skincare & makeup products). Or, customize your own snack box by combining any of the great snack sets they have available in their food marketplace. Here’s an option for the cookie lover on your list. This yummy assortment of gourmet vegan cookies has them individually-wrapped, and comes in cute holiday packaging. Although the cookies have nuts, they are soy-free, dairy-free, egg-free, and gluten-free. Made with clean superfoods, these soft & chewy cookies are also packed with plant-based protein. Great for vegans, vegetarians, anyone who is lactose intolerant, or those following a kosher diet. Also perfect for corporate or professional settings. Trying to come up with varied, nutritious, budget-friendly meals for the whole family 7-days can be challenging for anyone, let alone whose who exclude certain food groups. That’s why people LOVE meal plans! Vegan.io is an amazing site that provides vegan, plant-based recipes that are customized based on your daily intake goals & allergy information. When you sign up for their subscription, they send you weekly meal plans complete with nutritional info and grocery shopping list! We don’t know what your gift recipient will love more, the mouth-watering recipes or you for giving them this thoughtful gift! Having the right kitchen tools can make preparing vegan or vegetarian meals a lot easier. Consider these practical gifts for any aspiring or seasoned chef. Secondly, it’s designed to be used in a “set it and forget it” type of way. Just hit the button or set the time, then let it work its magic. On top of all that, it slashes cooking time and has more consistent results that using other cooking appliances or methods. Over 25,000 people loved it enough to give it positive reviews on Amazon can’t be wrong! Hint: if they’re already on the instant pot bandwagon, how about this radical red silicone instant pot accessory set? If there was any kitchen gadget that screams “made for vegans/vegetarians!”, it’s got to be this one. Spiralizers allow you to turn vegetables and fruits into curly spirals, which you can then use in a wide variety of ways. Some people like to use the noodles to swap out carbs, so they can have a more raw or clean diet. Others just like the fun of having food that’s cool and whimsical (kids LOVE spiral stuff!). This spiralizer has smart features that make it fun and easy for any vegan or vegetarian to use. A very common staple among vegans & vegetarians is smoothies, which are a quick & convenient meal choice that’s also pretty nutritious and healthy when made right. Help your loved one crank them out with ease by getting them a powerful blender like this one. Even if your loved one is not a smoothie-junkie, this type of blender is super versatile and can be used to make dips, sauces, purees, and more. One of the greatest gifts you can give a foodie is variety and new experiences. Cookbooks are an excellent way to provide that novelty and inspiration. Helping a new vegan or vegetarian build their cookbook library is an awesome way to support their new choice of diet. Deborah Madison is viewed by many as the Julia Childs of vegetarian cooking. Her award-winning, comprehensive cookbook is simply a classic, with more than 1,600 recipes and tons of information on vegan and vegetarian ingredients. This beautiful cookbook is chock-full of mouthwatering full-color photos, with over 800 pages of content that’s either delicious or helpful. No matter what kind of dish you are looking to make, this one covers them all: salads, soups, vegetables, fruits & nuts, pasta & noodles, dumplings, grains & legumes, tofu & proteins, eggs & dairy, breads, sauces, desserts, beverages…whew! This encyclopedia of recipes will be help your vegan or vegetarian newbie find tasty options no matter what they feel like making. Not all vegans or vegetarians made the switch because they wanted to. Some are encouraged (i.e., coerced) by their doctor or spouse, usually because of health reasons. If you know someone who is doubtful that they can find hearty plant-based foods that taste good, you gotta get them this cookbook. Oh, and you know who tested the recipes in this one? TEXAS FIREFIGHTERS. You KNOW that firefighters need plentiful, satisfying meals to do what they do, so if they enjoy these dishes you know, chances are your loved one will too! Every year, more and more vegan & vegetarian cookbooks come out to satisfy the demand for foods that are both tasty and healthy. Here are some of the best of the best from the latest crop of cookbooks that came out in 2018. The two guys behind BOSH! have an ENORMOUS social media following (millions and counting) for their inventive, satisfying recipes. This is not surprising at all when you see the stuff they put out (can you say tofu bacon cheeseburger hasselback potatoes?!?!?). They finally came out with a cookbook this year (yay! ), that you’ve just simply gotta snag for anyone you know that’s vegan or vegetarian. Vegans & vegetarians love comfort food just as much as anyone else! This book by an Atlanta chef-turned-vegan introduces plant-based ways to create the delightful flavors and textures that we seek from soul food. Decadent, fresh, crave-worthy recipes with exquisite color photos to whet your appetite! Chef Chloe Coscarelli proves that vegan and vegetarian dishes can totally have it all: bold taste, loud colors, unique textures, and most importantly, delicious flavors. Chloe first made a name for herself by being the only vegan chef to win Food Network’s Cupcake Wars, then went on to open her own restaurant after churning out multiple bestselling cookbooks. This latest one shatters the idea that being vegan or vegetarian is a “dietary restriction” and shows instead that it can totally be a flavor-packed cuisine. For foodies that are home chefs with a beloved collection of family recipes, this is THE gift for them. This package comes with more than just the beautiful recipe box. It includes double-side recipe cards, category dividers, and plastic holders that let you slide recipe cards into a groove on the lid of the box so you can view a recipe while cooking. Let your loved one get their family recipes out of a shoebox and into a lovely new home with this gift package! If your loved one switched to a vegan or vegetarian diet to try and improve their health, this gift can help them not just meet but SMASH their goals. 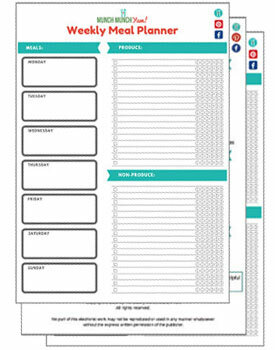 A combo food & fitness journal allows them to set goals and track if they are meeting them. Users can log their meals, snacks, sleep, mood, water & fresh veggies intake, workouts, energy level, positive points of the day, habits, and more! Because vegans & vegetarians are…well, fun! Nothing beets funny puns on coffee mugs, but a 3 for 1 special? Kale yeah! Let your loved one get in a chuckle with these clever puns, then color away their stress with this fruits & veggies coloring book. If you need coloring pencils too, here is a great deluxe 72-piece collection to help make this a complete gift set. Santa’s got nothing on you when you use our gift guide for vegans & vegetarians to find the right present for your loved one. From cookbooks to kitchen gadgets to gift baskets and more, we’ve got scores of fun vegan & vegetarian gift options for you to choose from. Get the perfect gift for your veggie-lovin’ friends and family members!